Diabetes is not necessarily a one-way street. Early studies suggest that persons with diabetes can improve and, in some cases, even cure themselves of the disease by switching to an unrefined, vegan diet. Unfortunately, none of these studies included a comparison group. So the Diabetes Action and Research Education Foundation provided a grant to PCRM to perform a carefully controlled test. Working with Georgetown University, we compared two different diets: a high-fiber, low-fat, vegan diet and the more commonly used American Diabetes Association (ADA) diet. We invited persons with non-insulin-dependent diabetes and their spouses or partners to follow one of the two diets for three months. Caterers prepared take-home lunches and dinners, so participants could simply heat up the food at home. The vegan meals were made from unrefined vegetables, grains, beans, and fruits, with no refined ingredients, such as vegetable oil, white flour, or white pasta. These meals averaged just 10 percent fat (as a percentage of calories) and 80 percent complex carbohydrate. They also offered 60-70 grams of fiber per day and had no cholesterol at all. The comparison (ADA) diet contained somewhat more plant-based ingredients than the average American diet, but still relied on the conventional chicken and fish recipes. This diet was 30 percent fat and 50 percent carbohydrate. It provided about 30 grams of fiber and 200 milligrams of cholesterol per day. Participants in both groups came to the University two evenings per week for group sessions covering nutrition, cooking, and support. There were several challenges in planning the study. Would persons with diabetes—and their partners—volunteer for the study? Would they change their eating habits and maintain the study program for the full three months? 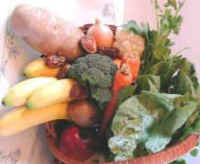 Could we find caterers who would dependably prepare and deliver attractive vegan and ADA meals? Encouraged by the strong results of this pilot study, we are planning a much larger study for next year. We all owe a great debt to these volunteers who generously gave their time to help us learn how to improve our treatments for diabetes.